A septic tank is a cement tank, installed underground that is part of your septic system. 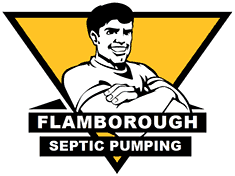 Septic tanks come in many sizes, such as 800, 1000, 1500, 2000 and 3000 Canadian imperial gallons. Usually the size you have depends on the number of bathrooms and the square footage of your home. Many older tanks have just one chamber whereas most new, modern tanks have two chambers. The two-chamber tanks have two lids to allow access to both sides of the tank. It is necessary to have both of these lids exposed when having your septic tank pumped. New systems may require a pump-up system. This consists of a pump chamber to house a mechanical pump which then pumps the water up into a raised septic bed. Occasionally the pump may quit causing your tank to fill up and you will require our pumping services to facilitate fixing your pump. A holding tank means that there is no leaching/weeping bed. When the tank is full, it must be pumped in order for you to flush your toilets, etc. They are commonly found near lakes, waterways and small properties that cannot accommodate a leaching bed. To locate your septic tank, you will need to find a 4” black pipe going through the foundation wall in your basement. The tank is usually located about 5-6 feet out where the black pipe exit’s the foundation wall. This can vary depending on where your well is located and the lay of the surrounding land. If you have difficulty finding your septic tank, you can call your local health department or call us for assistance in locating it. Your septic system is buried in your yard and is built to last. Your system performs a very vital task. It treats tonnes of organic waste each year. It consists of a septic tank and a leaching/weeping bed. Wastewater from your home (including, toilets, bathtubs, sinks, dishwashers, washing machines, etc.) travels to your tank via the outlet pipe. As your tank fills up, the lighter organic matter floats and the heavier matter (sludge) settles to the bottom. The naturally occurring bacteria (billions of microscopic organisms) in your tank works to break down the solid organic waste and turn it to liquid. As time passes, the liquid gets thicker – sludge – and this should be removed. The grey water in between the two layers flows to the second chamber where a similar process occurs. The water in the second chamber flows out through the outlet pipe to the leaching bed where it is absorbed into the surrounding ground. Please note that excessive use of disinfectants will kill off the good bacteria necessary for the proper functioning of your system and is not recommended. Even with proper use, your septic system still needs regular maintenance. Determining how often you need to have your tank pumped depends on the size of your tank and how many people live in the home. Preventative maintenance can save you money in the long run. Generally, a household of 4 people with a 1000 gallon tank would need to be pumped every 3 years. A household of 4 people with a 1500 gallon tank would need to be pumped about every 5 years. Getting your tank pumped every 3-5 years helps to ensure that sludge doesn’t get into your weeping/leaching bed, reducing the life span of the bed.